First-time cruisers benefit from the knowledge of experienced cruisers who can provide help, including mechanical or other repair support if needed. They offer assistance with port entry and slip requirements and guidance to local provisioning, dining and fishing spots. Group cruising is also fun, extending the camaraderie of fellow boaters and the opportunity of new friendships. Fall is the perfect time to go weather-wise – and organizers of the Baja Ha-Ha, the annual sailboat rally, and CUBAR, the powerboat equivalent which runs every other year, are still accepting applications from participants seeking to join their fleets. Baja Ha-Ha began in 1994 and attracts over 150 sailboats to its fleet (last year there were 171 boats). This year they’ll leave San Diego on Oct. 26 for the two-week cruise, which stops to anchor in Turtle Bay and Bahía Santa Maria prior to its planned completion in Cabo San Lucas Nov. 7. The Ha-Ha draws many repeat cruisers, with some continuing on to the Sea of Cortez, the Mexican mainland and points beyond. The Ha-Ha is limited to “boats over 27 feet that were designed, built and have been maintained for open ocean sailing,” its website (baja-haha.com) specifies, and is open to powerboats meeting the criteria. 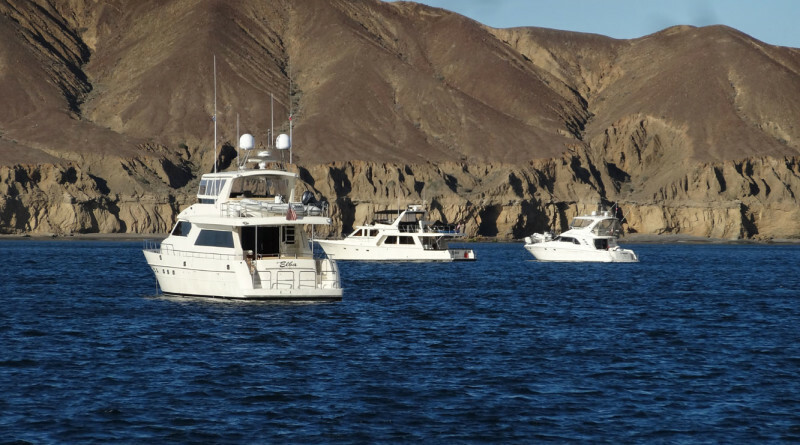 CUBAR (Cruise Underway to Baja Rally), which Del Rey Yacht Club member Bruce Kessler organized as FUBAR (Fleet Underway…) in 2007, gives powerboaters the experience of group cruising down the Baja coast, while benefiting from experienced cruisers’ knowledge. Mechanical, communications and medical support personnel accompany the fleet. Now “homeported” at the San Diego Yacht Club, CUBAR is limited to about 50 boats with “a minimum range of 450 miles at 8.5 knots” able to “pass a comprehensive safety inspection just prior to departure” on the 12-day cruise. The fleet leaves San Diego on Nov. 11 for Ensenada and concludes at Costa Baja/La Paz Nov. 23, with intermediate stops to anchor in Turtle Bay and Magdalena Bay before arriving at San José del Cabo, with a final anchorage in Muertos Cove on the way to La Paz. Full details are on the CUBAR website (cubar.sdyc.org). My husband Arv and I, both USCG-certified captains, were fortunate to crew aboard the 60-foot Odyssey, owned by Robert and Jackie DeMicheli, on the 2013 FUBAR, and hope to find another crewing opportunity for this year’s CUBAR. We both enjoyed the cruise and savored the hospitality and knowledge gained from our shipmates and fellow cruisers. I distilled much of that new information into an article I wrote for Sea Magazine, “Long-range cruising: do you have what it takes?” available on the CUBAR website, along with other useful articles. It contains a comprehensive checklist for long-range cruisers and a set of specialized resources, including books, websites and blogs, to help cruisers prepare themselves and their boats for their cruise. What became clear to me is that long range cruising is distinct from recreational boating. Anyone planning a long range cruise needs to prepare carefully, choosing a capable boat in excellent condition with adequate range and fuel, plus appropriate equipment (including a watermaker), navigation electronics and extensive spare parts and maintenance supplies. Most important, long range cruisers need to be self-sufficient and able to make their own repairs and know how to equip and provision their boats for an extended time at sea. With the right boat, equipment, skills and outlook, prepare yourself for a wonderful experience of a lifetime by joining CUBAR or Baja Ha-Ha. Sounds like a great cruise. We have friends who’ve done it and loved it. We had a sailboat with which we participate in the Baja Ha Ha in 2010. We now have a power boat and would like to make the trip again.